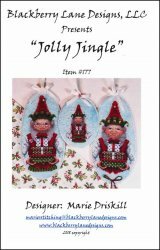 Jolly Jingle Ornament [E8768] - $14.00 : Yarn Tree, Your wholesale source for cross stitch supplies. A cross stitch pattern by Blackberry Lane Designs. These elves are ready to help Santa deliver your Christmas gifts! These elves are dressed up in their Christmas best, with their red sweater & jingle bell hat on. Small silver bell for the top of the elf hat is included. Stitch count 44w x 99h.